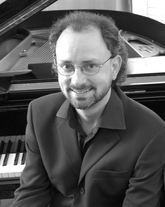 David Gompper has lived and worked professionally as a pianist, a conductor, and a composer in New York, San Diego, London, Nigeria, Michigan, Texas and Iowa. He studied at the Royal College of Music in London with Jeremy Dale Roberts, Humphrey Searle and Phyllis Sellick. After teaching in Nigeria, he received his doctorate at the University of Michigan, taught at the University of Texas, Arlington, and since 1991 has been Professor of Composition and Director of the Center for New Music at the University of Iowa. In 2002 - 2003 Gompper was in Russia as a Fulbright Scholar, teaching, performing and conducting at the Moscow Conservatory. In 2009 he received an Academy Award from the American Academy of Arts and Letters in New York City. Gompper's compositions are heard throughout the United States and Europe. In 1999 his Transitus (for wind ensemble) premiered at Carnegie Hall, and a number of his works have premiered in London's Wigmore Hall, including: Homage a W. A. (William Albright) for piano; and Shades of Love, a song cycle on the poetry of Constantin Cavafy. Subsequent returns to Moscow have included premieres and performances of Crossed, Music in the Glen, Six Love Poems, Star of the County Down, Butterfly Dance, Spirals and Ikon. His latest work for violin and piano, Ikon, was taken on a 14-concert tour throughout the US and Europe last fall with Wolfgang David, a violinist from Vienna with whom Gompper actively collaborates as a pianist and composer. They have recorded three CDs on the Albany and VDE-Gallo labels. He recently completed several new compositions including a 28' song cycle called The Animals on poetry of Marvin Bell written for Stephen Swanson, and an organ work for Konstantin Volostnov. He is working on several new compositions including a piano trio and one for solo cello. His Violin Concerto and other orchestral works were recorded by the Royal Philharmonic Orchestra (London) in December 2009 for a release on Naxos in early 2011.